Location: On the Morledge, facing the new County Court complex, opened in 1989. Historical Information: Established in the first half of the 1700s. 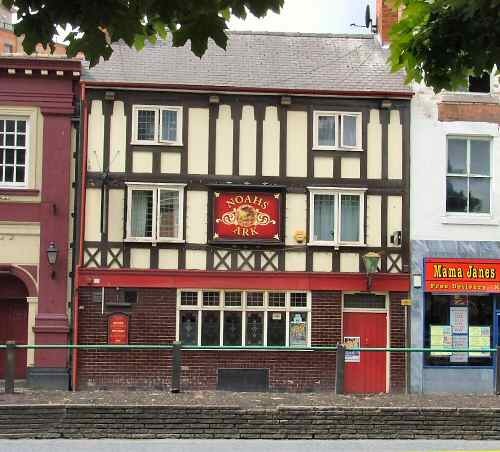 For 30 years it operated alongside another pub bearing the same name, until in 1873 the adjacent pub changed its name. The only concession made to avoid confusion during that lengthy period was adding 'Old' to the title, in 1852. This has now been dropped. The name probably originates from the story of coin-clipper and forger Noah Bullock who lived in an ark on the River Derwent. Curiosities: Noah Bullock a 17th century gentleman and counterfeiter, built an ark for himself and his family on the River Derwent. It was from here he carried out his illegal occupation, but in 1676 his crime - a capital offence in those days - was discovered and he appeared before the Recorder for Derby, Sir Simon Degge. He knew Degge well and promised to end his criminal activities and destroy his ark, in order to escape the hangman's noose. 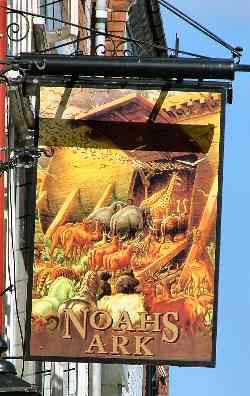 The Noah's Ark pub, is thought to have been named after him, and is said to be visited by his ghost. www.derbyshire-peakdistrict.co.uk is an independent, not for profit website. No recommendation of any establishment is implied by inclusion on this website. Select a pub and click to go to the page, or to return the Derby Pubs Home Page click here. 1. To return to the main site click the link below. 2. To return to the contents page of the main website click the link below.